Just go to create a new post, as you normally would. That is how the date normally looks, but you see that 'change' next to the time? Please hit that. Now you have this, where you can adjust the date and time. As soon as you put the cursor in the date box to change the day a calendar pops up to select the date (or to even change the month). Once you've selected your date, change the time. Please remember, time must be in 24 hour increments. As in 6pm must be as 18:00. I guess that's military time? Do your post as normal, then hit post and you get this. If later on you want to edit your post, change something, etc. 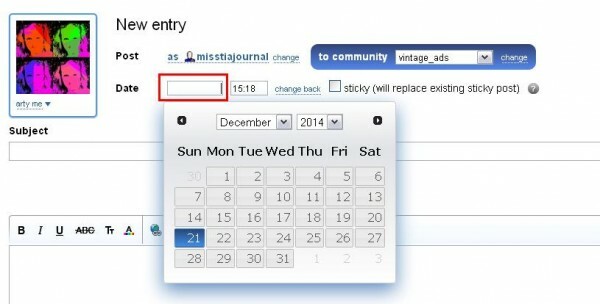 You can find your scheduled posts when you hit your 'journal' tab. Thanks for posting this! Great walkthrough. you're welcome!! it really is a neat feature! Yes, that is a neat feature (I have used it in other communities), but it only works if you are on the posting list or whatever LJ calls it for users who are free to post without going to moderation. If your post goes to moderation, you can't schedule it. The ability to change date and time is not available. Just mentioning it, since your helpful walkthrough won't work for everyone. thank you so much for that info!! i had absolutely no idea it wouldn't work with moderation!!! i will change the entry to mention that!! Re: oh wow, thank you!! Although I forgot to say that I've also used scheduled posts in my journal a lot recently, so your walkthrough will work for people who want to schedule a post in their journal, too. i have edited the post to mention THAT too!! i honestly never even considered the usage of that for non-community use!! profuse thanks to you!! But I do know a few people who use it as a post holding queue, as well. They can write bits and pieces and release it whenever it suits them. Or space out posts if they go on a writing/posting spree. that's a great way to look at it!!! i will sometimes PRE-date something if it's gonna be a long draft...i think that's the right term....meaning i'll change the year til 2 years from now and have it set to private and then it'll be on top to remind me to work on it!